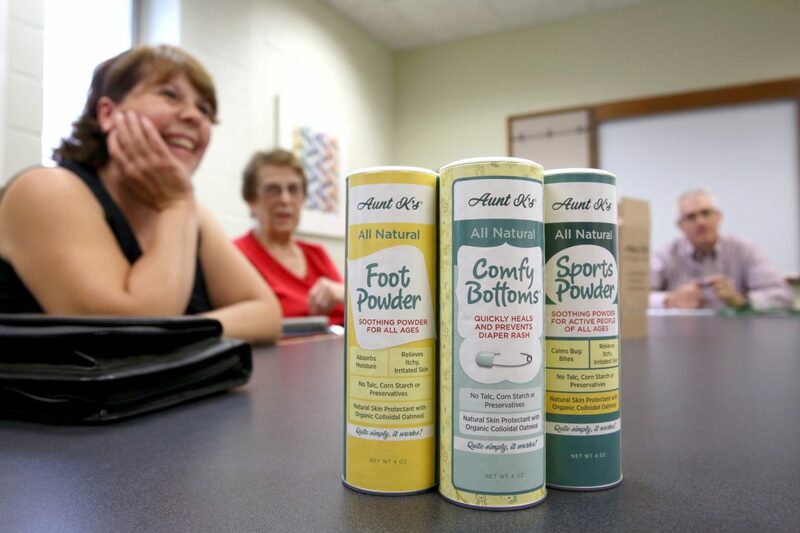 From left, Aunt K’s All Natural Remedies owners Kay Widule and Sharon Horstman discuss their product with Roger Gehring of the University of Wisconsin-Stout’s Discovery Center in 2015. Wisconsin lags behind the rest of the nation in creating startup companies. The Discovery Center helped the business find suppliers for its natural-ingredient products. Sen. Kathleen Vinehout’s criticism of Wisconsin’s startup activity was Verified by The Observatory as the state has ranked last in the past three years in the Kauffman Foundation’s annual report on state startup activity. Gov. Scott Walker defended this on the Sunday talk show UpFront with Mike Gousha on WISN TV in Milwaukee in November. Walker said Wisconsin has consistently ranked poorly in startup activity “long before” he took office and that the state is “fairly conservative” when it comes to venture capital and startups. Walker noted in a Wisconsin Public Radio interview that Wisconsin has ranked in the top 10 states for startups remaining in business after seven and 10 years. Although Wisconsin does well in startups remaining in business for a long time, why has it done poorly in business startup activity? Wendy Guillies, president and CEO of the Ewing Marion Kauffman Foundation, said the story is not unique to Wisconsin. The overall trend in the United States for business startups is half of what it used to be in the 1980s. Guillies cites five factors that would increase the chances for success in startups: adapt existing regulations to the new economy, reduce the cost of starting a business, increase the labor market supply by expanding immigration quotas and introducing startup visas, decrease incumbent bias to support entrepreneurial entry and competition, and more data and research on entrepreneurship. There are many reasons why it is good to invest in a startup in the Midwest, according to Alec Slocum, co-founder and CEO of ABODO, a Madison-based apartment-hunting service. Slocum wrote about why he chose to keep his startup in the Midwest for VentureBeat. The lower initial costs for creating your business together with the affordable cost of living for employees are vital for any business, and the Midwest offers both. In another VentureBeat column published in June 2017, Slocum wrote after the release of the Kauffman Foundation report about some of the issues and challenges ABODO experienced in Wisconsin. One of the big issues he notes is that investors in Wisconsin are “revenue-centric” and that can put a lot of stress on newer companies even before they have begun. He underlines that receiving funding here is harder than it is elsewhere. Another is, “the hiring pool has fewer bigger fish.” By that he means that the small size of Madison and lack of history in startup activity makes it difficult to attract executives with experience working in rapidly growing companies. Convincing experienced executives to come to Wisconsin is hampered also by the weather. The cold winters make “it hard to convince someone used to 70-degree January days” to move to the state, according to Slocum. Taken together with the political climate of increasing partisan divide it becomes difficult to attract top tech talent and investors to move here as there are many alternatives to Silicon Valley across the country. A 2018 Cyberstates report from CompTIA, the largest leading tech association in the United States, using a mix of public and private data, established that in 2017 there were 102,274 tech workers in Wisconsin compared with 100,025 in 2016 and 93,742 in 2015. The report estimated the rapidly growing tech sector accounts for 6.3 percent of the state’s economy. Teodor Teofilov is a journalist from Sofia, Bulgaria.